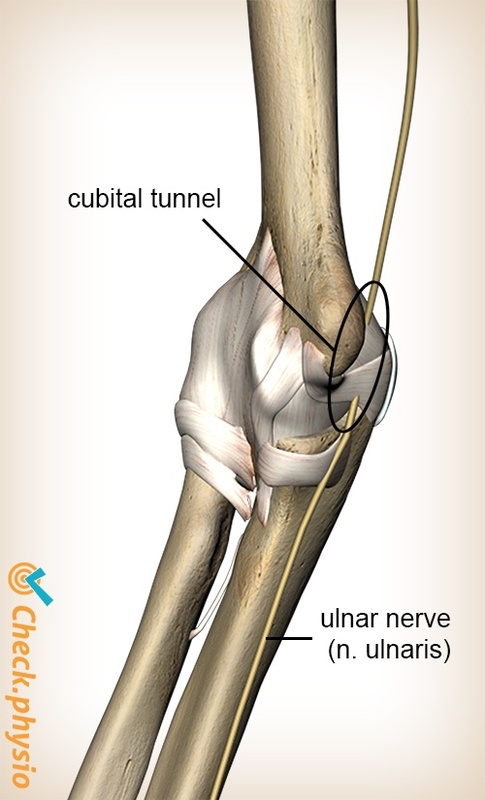 Cubital tunnel syndrome describes the irritation of the nerve that runs along the inside of the elbow. This can cause pain, pins and needles and numbness from the inside of the elbow towards the hand and into the little finger. The presentation of cubital tunnel syndrome is similar to the pain that occurs when the elbow knocks against an object and an electrical, tingling or burning sensation shoots from the elbow to the wrist. This is also referred to as the "funny bone". 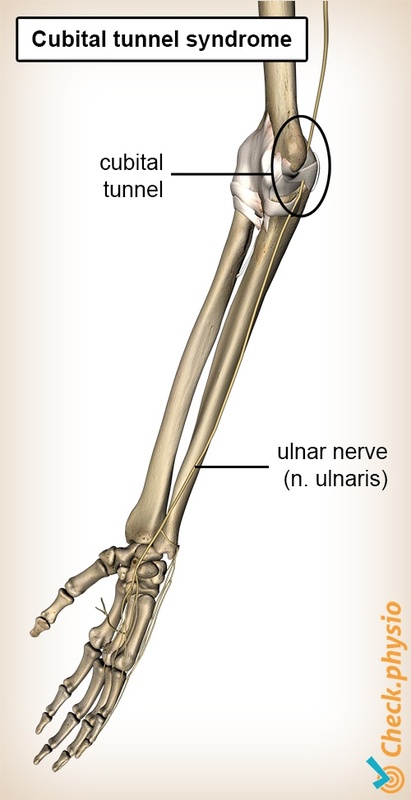 The nerve that runs along the inside of the arm is called the "ulnar nerve". It runs along the inside of the elbow through a tunnel (cubital tunnel) which is formed by the elbow and one of the joint ligaments. When the nerve becomes impinged in the cubital fossa this results in symptoms on the inside of the elbow and over the course of the nerve through to the hand and fingers. Cubital tunnel syndrome can be caused by an accident or fall, or by frequent pressure on the elbow (for example leaning the elbow on a table). It is also more common in people who frequently bend their elbows (for example carpenters, construction workers, office workers, playing a musical instrument, or lifting weights. People who sleep with bent elbows are at increased risk. Pins and needles and pain in the hand on the side of the little finger and on the inside of the elbow/forearm. Sometimes disrupted sensation will occur in the area described above. A fully flexed elbow can make the symptoms worse. Typical symptoms when sleeping on a bent elbow at night. An in-depth conversation about the symptoms is followed by a physical examination. A few tests will be performed to stretch the irritated nerve and extra pressure will be applied to elicit the symptoms. An EMG - or electromyogram - can provide a definitive answer. Relative rest and avoiding activities that provoke symptoms can yield improvements. The physiotherapist can advise you and may be able to reduce the symptoms. If the symptoms persist or become worse, a surgical procedure can be considered.